Over at (one of his) sites, Dakota Death Trip, hubby posted this fabulous old ad. 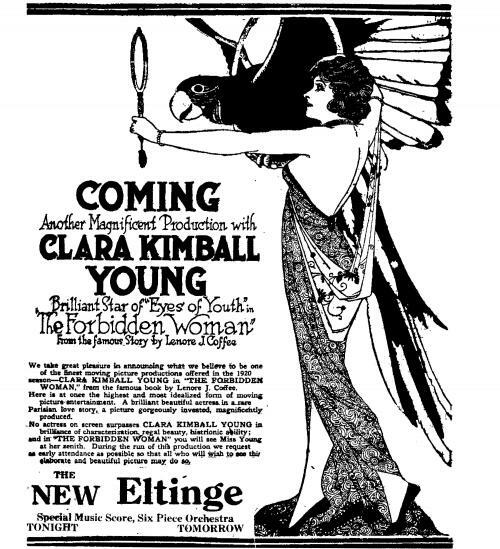 While you might think it’s an advertisement for a woman, Clara Kimball Young, it really is promoting a film, 1920’s The Forbidden Woman (not to be confused with 1948’s Forbidden Women, which allegedly stars women recruited from a Los Angeles whorehouse). Why is Clara Kimball Young such a focal point? Because back in the day, women ruled the box office! In the 20’s and early 30‘s women dominated at the box office. Women were the biggest stars, featured month after month on the covers of fan magazines (it was a rare month indeed when a male face turned up on the cover! ), and society was fascinated with women in general. Also related, my post on female celebrity pitch women at the turn of the (last) century: Julia Marlowe, Selling Stuff From Head To Toe.